The summer before my junior year of college, I moved into an apartment with two fabulous girls – Jackie and Isabel. We were all out on our own for the first time and, as you’d expect, we really weren’t the best cooks. They are also Filipino, so a lot of their normal was downright foreign to me. I remember cleaning out the fridge one day and finding a cake that was bright purple – and quickly pitching it, wondering how long it had managed to sit there to turn that color. When Isabel went looking for it later that night, I told her what an awful color it had turned. She stared at me dumbfounded before telling me it was from a Filipino bakery and was supposed to be that color… oops! 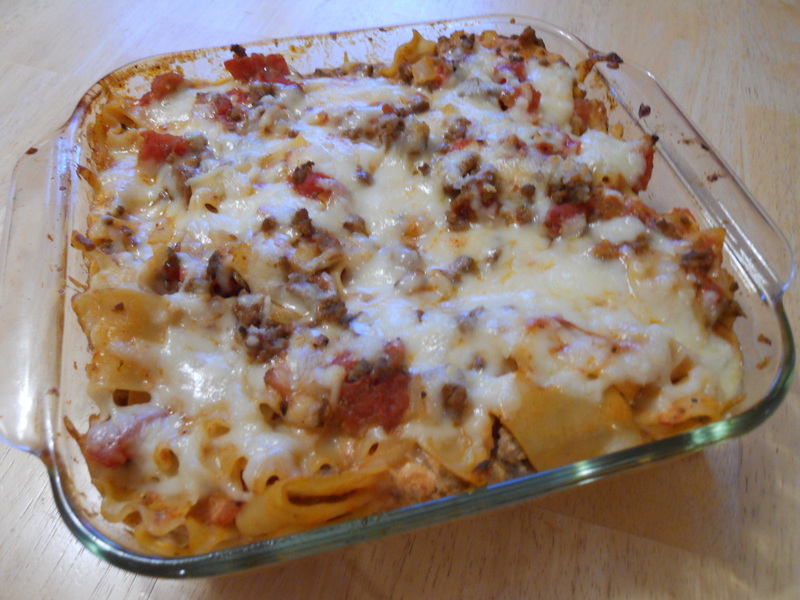 One day that first summer, I came home to dinner – Jackie had made lasagna. Except, instead of lasagna noodles she’d used elbow macaroni and her version of “layer the noodles, meat and cheese” was all the noodles, all the meat, all the cheese. It was our first home-cooked meal in a while and we devoured it, but I remember being really amused at her interpretation of the recipe. So, I had to laugh when I got my latest swap recipe for a Ground Beef Ricotta Bake from Cooking for Fun. I imagine that Jackie really had a recipe like this and didn’t botch it as badly as I was imagining. I’m so sorry for doubting you, Roomie! I made a few adjustments to make this more lasagna-like: I used broken lasagna noodles and swapped the tomato and ketchup for canned tomatos and pasta sauce. It’s got all of the flavor of lasagna without the tedious step of layering things properly – aka, Lazy Lasagna. Preheat oven to 350F degrees. Spray an 8×8″ baking pan with non-stick spray and set aside. Cook lasagna according to package directions. Drain and set aside. Meanwhile, brown ground beef and drain any excess fat. Add garlic and onion to skillet and cook until onions are transluent and soft. Stir in basil, oregano and tomatoes and heat through. Mix in ricotta cheese. Remove from heat. Add the cooked lasagna pieces and pasta sauce to the pan. Toss until everything is well combined. Spread in prepared baking pan and top with parmesan and mozzarella. Bake for 20 minutes or until the cheese is melted and the sauce is bubbly. That must have been such a culture clash! Glad you had a successful swap! Sounds delish, and who doesn’t like to have a “lazy” meal on hand?? Love the story about the purple cake. 🙂 Glad this was a good trip down memory lane.